The email also contains a personal Snapchat of Nemeh’s that surfaced on April 25 on a Facebook Free or For Sale Page for a brief amount of time before being quickly removed. When asked about him leaving his former positions as AS Senator and Chief of Staff in the Student Advocate General Office, Nemeh said that the allegations were “not at all” true. Nemeh also justified his statement at the AS Presidential forum by saying, “student fees that go directly to AS are about $200 a year, because most of your student fees do not go directly to AS. They go to things like CLAS, CAPS, and other services outside of AS. They are actually earmarked, AS can’t really touch them. 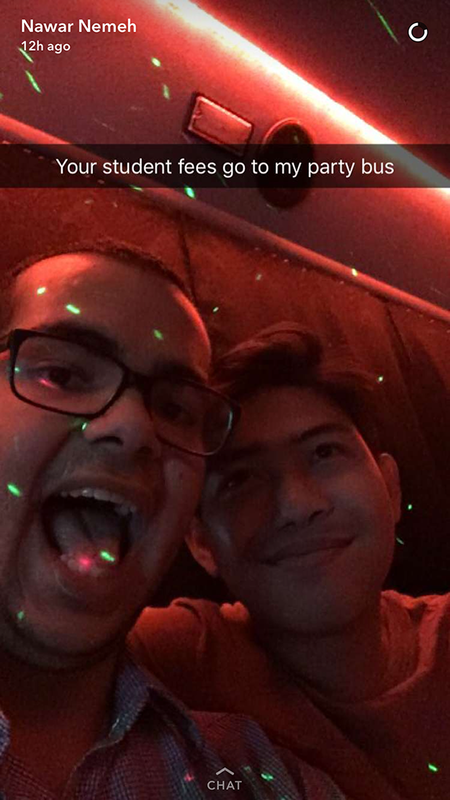 Concerning the Snapchat, Nemeh did admit that it was his Snapchat taken from his personal Snapchat account. According to Nemeh, “That statement [in the Snapchat] is a joke. That ‘party bus’ was not an actual ‘party bus.’ It was a bus to take people to dinner that had cool lighting on the side. It was not paid for by student fees, we personally pooled in together to pay for it because we knew we need the bus to go to dinner in downtown Irvine. So we went there to dinner and we made joke about it on Snapchat. “The delegation to this conference was lead by people from the other party [Campus United], not myself. So if any decision were made about purchasing anything on that trip it was not made by me, I was simply a delegate out of 85 people. I was one person of 85 people who did not make decisions on where we were going for dinner, what transportation we used, what workshops we were attending, nothing of the sort. That delegation was actually lead by Kristen Hsu, which is the current candidate for EVPSA for Campus United. So if anyone is to blame and anyone should be investigated for misuse of student fees it should be her, not me. In an exclusive statement to The Tab, Concerned Gaucho said: “I have no comments to make, except that student fees are a huge problem for AS. Simply put, AS is not providing the amount of services relative to other UC campuses who pay less in fees.